A collection of charts, updated monthly, with up-to-date information and predictions about the course of the California real estate market. 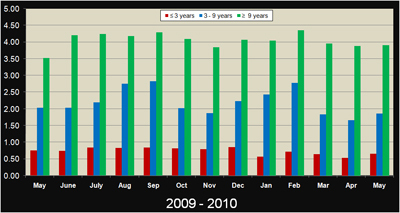 Homes sold in California, per month, from September 2003-present, with accompanying analysis and predictions. The value of stocks in the market, represented by the S&P 500 index, is contrasted with the price/earnings (PE) ratio, along with first tuesday insight and forecasting. 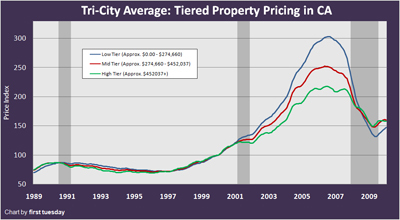 Tiered pricing from the Case-Shiller index, comparing the prices of all homes in San Diego, Los Angeles, and San Francisco over the past twenty years. 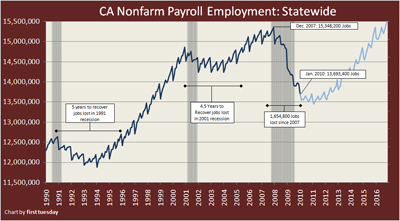 The past and future of jobs in California: current, detailed employment numbers for the state and its biggest counties. The dark side of Jobs Move Real Estate: the unemployed percentage of the labor force, with analysis of the vital role jobs play in the market at large. 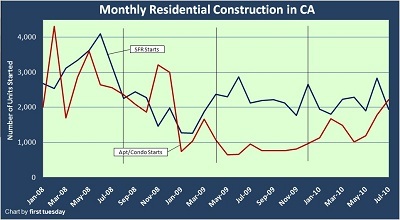 New homes constructed in California on a monthly basis, displaying trends in the construction of new single-family residences (SFRs) and Apartments/Condos. 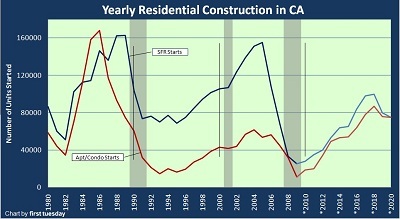 New homes constructed in California on a yearly basis, displaying trends in the construction of new single-family residences (SFRs) and Apartments/Condos. 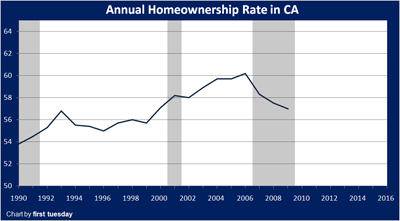 The rate of single-family homeownership in California since 1990. 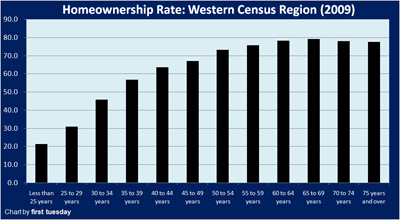 2009’s rate of single-family homeownership in the western region, broken down by age group. 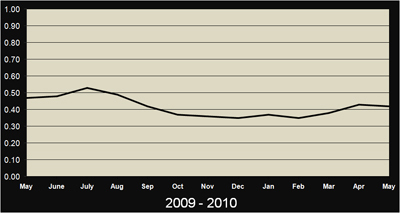 The rental vacancy rate in California from 1990-present, courtesy of the United States Census Bureau. The total California population of “Senior Citizens,” citizens aged 65 and over, from 1980-present, with first tuesday projections based on the current population of Baby Boomers. 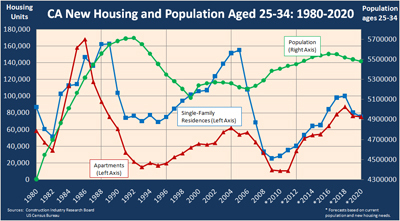 The annual number of 1st time homebuyers, aged 25-34, with the construction of single- and multi-family residences from 1980, with first tuesday forecasts. The ratio of adjustable rate mortgages (ARMs) to all loans originated in the United States. California’s annual number of personal bankruptcies filed, and a brief explanation of bankruptcy’s often-overlooked tie to homeownership. 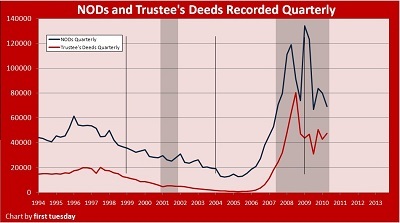 Notices of Default (NODs) issued quarterly, from 1994-present, giving an in-depth look at foreclosures past and future. 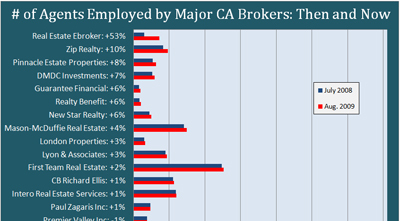 The number of agents employed by California’s 30 largest brokers in July 2008 and August 2009. 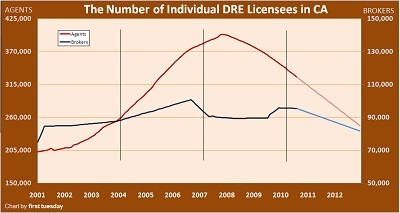 The total number of DRE-licensed brokers and sales agents in California from 2001-2009. 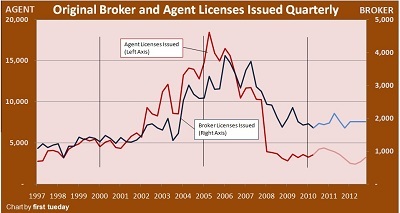 The number of sales agent and and broker licenses issued by the California Department of Real Estate from 1997-present. 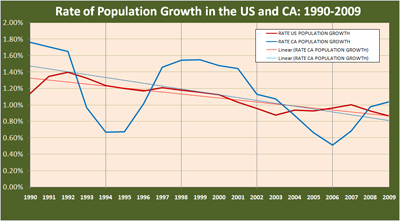 The rate of population growth for California since 1990, compared with growth rates for the entire nation. Historical Values and Returns from all US Real Estate Investment Trusts (REITs). 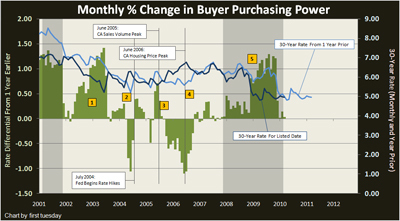 The buyer’s ability to purchase a home, as influenced by the annual change in federal rates. 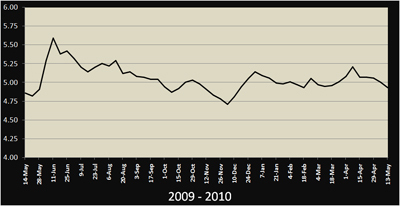 An essential tool used to predict economic conditions affecting the real estate market. 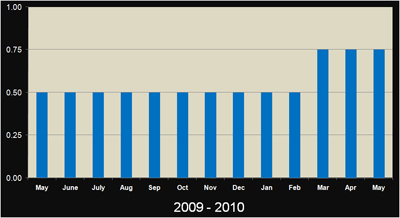 Used to determine the minimum interest rate the seller must impute in a delayed §1031 transaction. 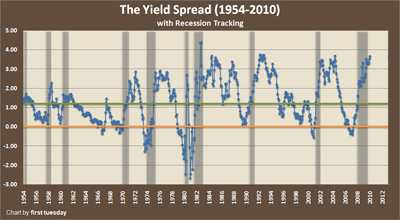 The base price of borrowing money in the short-term, used to determine the yield spread. 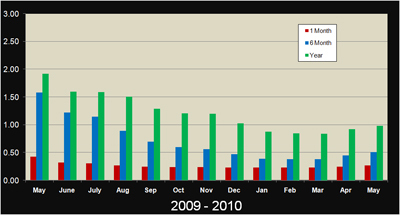 Indicates the direction of future FHLMC rates. 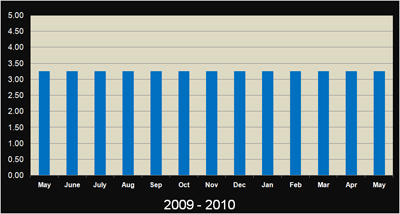 The 30-year rate at which a lender commits to lend mortgage money in the United States-West as reported by FHLMC. 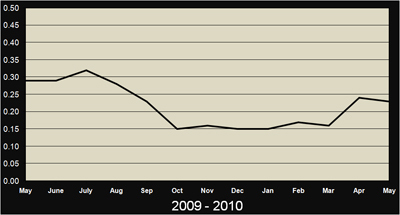 The 15-year rate at which a lender commits to lend mortgage money in the United States-West as reported by FHLMC. 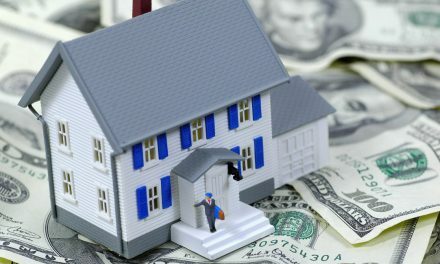 The ARM interest rate equals the Cost-of-Funds, plus the lender’s profit margin. 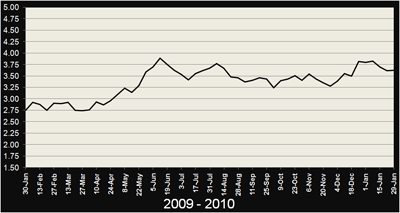 The current index reflects the cost of funds two months’ prior in the Unites States-West. 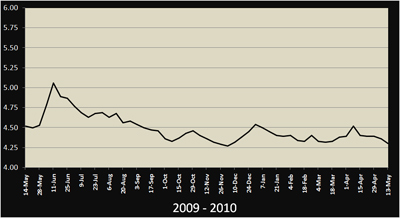 The average 15- and 30-year conventional commitment rates as reported by the FHLMC, superimposed with the 12 month treasury average. 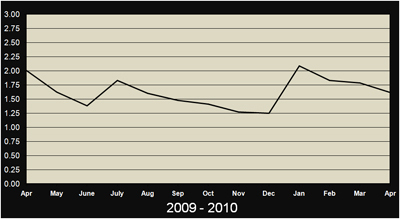 The prime rate is used by banks to price short-term business loans and set ARMs. Usury law limits the annual interest yield on nonexempt loans to 10%, or the discount rate plus 5%, whichever is greater. Determines minimum interest yield reportable on carryback financing. The AFR category is determined by the carryback due date. 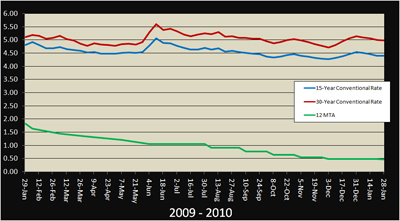 POLLS: Does the MID impact home prices and sales volume?